For a person whose body is covered with ghastly layers of aging and dead skin, 35-year-old Esther Njeri Kimani seems rather too comfortable, almost snug, with the condition. She could have decided to languish in seclusion, to resign to her “fate” and just let her life roll by, but she won’t have any of that. At first sight, she looks like the ordinary 30-year-old next door. Slightly built and equally shy, she loves the camera lens. And the lens loves her back. She seems happy, sounds felicitous even. Basically, she is the girl sitting next to you in the matatu... until she stretches her hand to greet you. Then you notice the skin condition she has learnt to live with and you squinch in your seat. Her palm is smooth, but the back of her hand bears uneven scaly skin punctuated by black marks that overlap each other. The creases on her hands and legs are pronounced, giving an impression she has not oiled her skin in a long, long time. But oil herself she does, only that Ichthyosis, a debilitating skin ailment that she has suffered since childhood, does not give the outer layer of her skin the time to develop a sheen like the rest of us. The disfiguring condition is more concentrated at the elbow, knee and ankle joints. Luckily, her face has been spared.The disease has covered her from the nape of her neck to the tip of her toes, and that is why you are most unlikely to see her in a short-sleeved blouse or T-shirt. Dr E N Kamuri, a dermatologist based at the Kenyatta National Hospital, says medical experts are yet to figure out the cause of this condition. That means no one has found a cure for it yet, so Esther must learn to live with it. Dr Kamuri says Ichthyosis is a family of genetic skin disorders characterised by dry, scaling skin that may be thickened or very thin. The prefix “ichthy” is taken from the Greek root for the word “fish”. For more than 20 years, Esther struggled with the effects of this condition on her life. She barely pulled through cold days, and July, the coldest month in Kenya, proved a nightmare. But over the last one decade she has learnt to manage the condition by moisturising her skin often and keeping it covered to protect it from the elements. Her school days, she says, were a nightmare and the stares from the general public unending. Few peers understood her condition, which had for years gnawed on her self-esteem. “My childhood was a very painful experience. But I think my parents were more affected by the condition than I was because they could not understand what was happening. I was a bit naive then,” she says. When she finally grew up, she decided to seek medical advice on her own, and so she sought the services of a dermatologist. “I wanted to know what was happening,” she says. “I may have been born with this condition, but I had not yet resigned myself to it, so I knocked on a doctor’s door and asked him what the hell was wrong with me." “They looked at me, did several tests, then broke the gory news... in bits. I had ichthyosis. There was no cure. I had to learn to live with it." At about the same time, she got a sponsor who invited her to Scotland for tests. She lived in the European country for two and half years, and by the time she came back home, she had learnt how to manage the condition. Though the itching has stopped, she bears scars of the disease and wears long-sleeved sweaters and socks to cover up. She suffered from depression in her teen years and stress in her college years, but she has now embraced the importance of self-worth. “I had a very low self-esteem, but with time I have become a confident woman,” she says. That confidence has spawned some good tidings for her, and even though she does not reveal much, she says her life has changed for the better since she resolved to make the best of her condition. “For one, I found a man who is compassionate, understanding and supportive,” she says. “He fully understands my condition and has taught me a lot.” Esther does not reveal much about her knight in shining armour, other than that he is Austrian. Before the Austrian arrived into the scene, she had been in a seven-year relationship and engaged for marriage, but she did not eventually walk down the aisle due to what she calls “spiritual differences”. Her current partner is a born-again Christian and they “share scriptural Bible verses” whenever they communicate. “After fighting all those emotions of feeling unloved and stressed, today I’m happy, intelligent, sociable, and I enjoy life to the fullest,” she beams. So social has she become that for one year she worked as amatatu conductor, a job she says had its own version of bitter-sweet moments. “I plied Route 30 (Uthiru-Nairobi), and the best part of the job was that I would make new friends every day,” she says. However, she was not spared the constant harassment by traffic police officers that is the bane of the trade, and sometimes the never-ending competition with male conductors left her emotionally and physiologically drained. After a month on the job, she resigned and started a second-hand clothes business, and this is what feeds her and pays her rent today. Dr Kamuri says patients with this condition are often ostracised, and that cases of isolation, low self-esteem and depression are common. The skin specialist advises parents to encourage their sons and daughters with the condition to have a positive attitude in life so that they can deal with the situation better when they are adults. “We counsel parents and those interacting with persons suffering the condition to understand that there is no cure, but one can lead a normal life by constantly moisturising the skin,” says Dr Kamuri. “Caring for Ichthyosis is as much about looking good as feeling good,” he adds. She is grateful to her close friends and family, whom she says have been a pillar of strength for the last three and a half decades she has been battling the disease. Every now and then, she logs onto the website http://tinyurl.com/7vudo7c, which brings together persons with Ichthyosis. There, they share their experiences with the condition and encourage each other to soldier on. “It’s a tightly-knit community that has been of great help to me,” she says. So what do you do when you meet her on the streets and notice the rough skin on her? The old theory that a butterly flapping its wings can cause a hurricane on the other side of the world may be somewhat far-fetched. But that a ship dropping anchor can disrupt the lives of millions has become painfully evident. That is what happened off the Kenyan coast when, by unlucky chance, an anchor scored a direct hit on an underwater fibre-optic cable. The knock-on effect is a predicted 20% slowdown in internet speeds inKenya, Rwanda, Burundi, Tanzania, Ethiopia and South Sudan, the BBC reported. The offending ship was waiting to enter the port of Mombasa at the weekend when it halted in a restricted area. 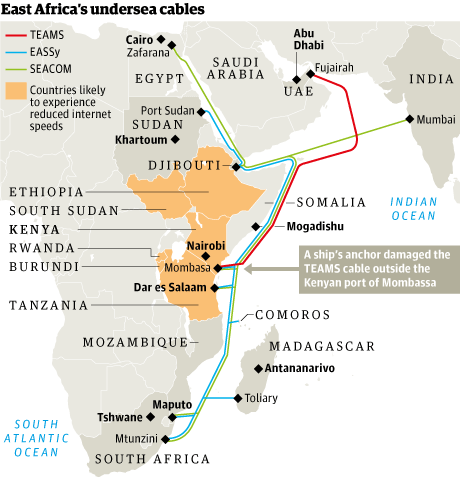 The damaged cable, owned by The East African Marine Systems (Teams) – in which the Kenyan government has a share – is one of three serving east Africa. It could take up to three weeks to repair. Joel Tanui, general manager of Teams, said: "We wish to notify all our stakeholders of ongoing emergency repair works and apologise unreservedly for any inconvenience this may cause. The cable should be fully operational within the next three weeks." 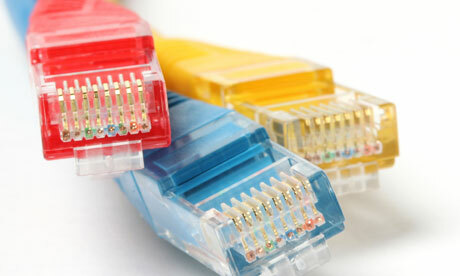 Fibre-optic cables are typically composed of about four strands, each the diameter of a human hair and capable of carrying millions of phone calls and data connections simultaneously. They are protected by an armour of thick steel. Teams will send remote-controlled submarines to assess the damage and raise the cables to the ocean surface, where specialist engineers will carry out repairs. The cable links the region to the United Arab Emirates. Internet service providers and mobile phone operators have rerouted to a 10,625-mile cable provided by Seacom, which since 2009 has linked east Africa to Europe, India and South Africa, putting pressure on its bandwidth capacity. Eassy, another connection activated in July 2010, links countries along the east African coast. Toby Shapshak, editor of Stuff magazine in South Africa, and author of a forthcoming book on innovation in Africa, said: "Sadly, this reveals how fragile the physical infrastructure for Africa's internet access is. Because of the distances involved, the primary connections, in the main, are undersea cables which can be easily disrupted by a careless anchor. He added: "But it does show there has been progress in African connectivity. Luckily, we've moved on from single cables, so there is at least some redundancy when events like this occur. Losing 20% of East Africa's connectivity is a lot better than losing all of it, as would've been the case had this happened a few years ago. "The enormous cost of laying the cables - and the delays in fixing them, as this shows - is part of the reason internet access in Africa remains expensive." The slowdown has caused irritation to east Africa's growing band of Facebook and Twitter users, as well as the rapidly growing hub of internet startup companies in Kenya. Internet subscriptions in the country increased from 1.8m to 3.1m in the first year after the information pipelines arrived. There was also a huge growth in e-commerce. Users vented their frustration on Twitter. Harry Karanja, posting as@startupkenya, wrote: "Looks like all isps have now routed their traffic to Seacom. Internet is crawling!" Another tweeter, @shuhi said: "I'm officially kissing YouTube goodbye till this whole Seacom maneno is sorted." At least two law enforcement officers were injured Monday during a clash with members of the Occupy movement who were at the state Capitol to counter a rally by a group protesting violence by blacks against whites in South Africa. The clash erupted in the afternoon as California Highway Patrol and Sacramento police officers were escorting about 35 members of the South Africa Project to a parking garage after their protest outside the Capitol building. About 50 members of Occupy Oakland began throwing cans and bottles at the South Africa group and at the officers. The Occupy members then clashed with the officers as people with the pro-whites group hurried into the parking garage. “It was the activists across the street engaging the officers,’’ said CHP officer Sean Kennedy. Two officers suffered minor injuries and were taken to a hospital. CHP Capt. Andy Menard said one officer who was struck in the face by an object was released from the hospital. The second officer was getting X-rays after apprehending a person suspected of throwing objects, Menard said. Kennedy said the officer who was struck by an object was showing signs of possibly being affected by some type of chemical or pepper spray. 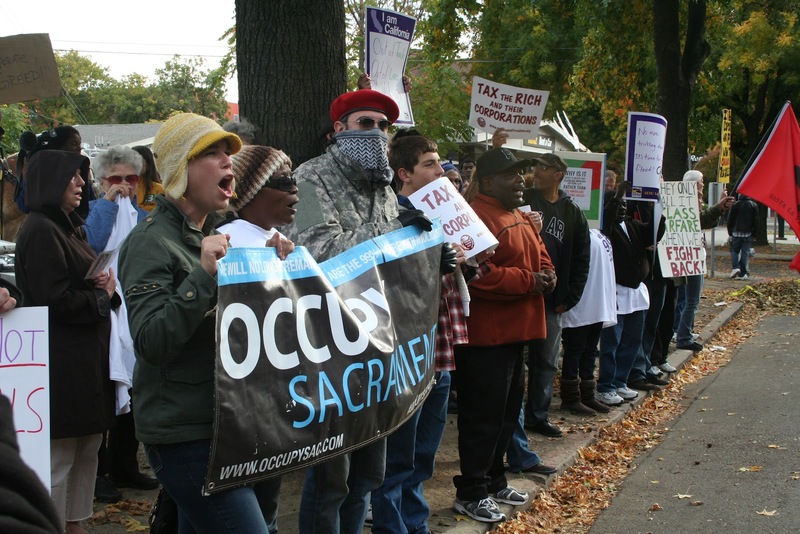 The CHP arrested three members of the Occupy group on suspicion of disobeying an officer. The violence abated after a large contingent of law enforcement arrived at the scene, about a block from the Capitol. The clash followed a tense afternoon during which peace officers kept the two groups separated outside the Capitol. Members of the South Africa Project were trying to draw attention to what they said is black-on-white violence in that country. Organizers said similar demonstrations were planned in other states and elsewhere in California. The group was mostly male and white, some with shaved heads and prominent tattoos. Many of the Occupy protesters, some wearing hoods or masks, said they came from the San Francisco Bay area to counter what they called a racist group affiliated with former Louisiana Ku Klux Klan leader David Duke. Morris Gulett, a spokeman for the South Africa Project, called the clash in Sacramento unfortunate. Occupy protesters had been cursing at the South Africa Project rally and at officers keeping the two sides apart. Ryan Stark, 26, who said he is part of Occupy Sacramento, said he joined the protesters challenging the South Africa Project protesters because there needed to be a showdown. The public was being kept away from the scene of the confrontation by police officers, who were not commenting to reporters. The city’s light rail system was stopped through the section of downtown where the clash occurred, and commuters were not allowed to leave the area. Earlier in the day, a 17-year-old girl with Occupy Oakland was taken to Juvenile Hall after she became combative and assaulted an officer who asked her to pick up litter, Kennedy said. UNITED NATIONS — Pirate attacks off Africa’s west coast in the Gulf of Guinea are increasing and becoming more violent, sophisticated and systematic, the U.N. political chief said Monday. Undersecretary-General B. Lynn Pascoe told the U.N. Security Council that the International Maritime Organization received 45 reports of piracy incidents involving seven west and central African nations in 2010 — and 64 reports of attacks involving nine countries last year. In the first two months of this year, he said, the IMO has already recorded 10 piracy incidents off the coasts of Benin, Congo, Ivory Coast, Ghana and Nigeria. “In addition, we know that not all piracy incidents are systematically reported,” Pascoe said. He said Gulf of Guinea countries need a united front to respond to the growing piracy threat and urged leaders from west and central Africa to hold a summit as early as possible this year to develop an anti-piracy strategy for the wider region. 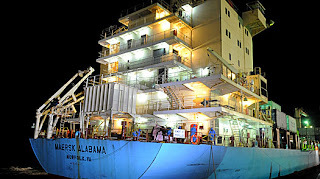 Despite some national and regional efforts, Pascoe said, “the threat has become even more alarming as the pirates have become more violent.” He pointed to a pirate attack off Nigeria two weeks ago where the captain and engineer of a cargo ship were killed. “So far, the attacks have primarily targeted the lucrative cargo onboard the ships rather than taking hostages for ransom, which has been the practice off Somalia,” he added. As an example of the heavy cost, Pascoe said recent reports have suggested that Nigeria is losing an estimated 7 percent of its oil resources to criminal activities including piracy. Benin’s defense minister, Issifou Kogui N’Douro, told the council that the Port of Cotonou which accounts for 90 percent of Benin’s trade, has seen a 70 percent decrease in the number of ship arrivals since the pirate attacks began. He said insurance rates have soared because of the piracy threat, which is another reason many ships are staying away. Abdel-Fatau Musah, director of political affairs for the commission of the West Africa regional group ECOWAS, told the council that piracy is increasingly dovetailing into other forms of transnational organized crime, including human and drug trafficking and terrorism. Musah said it’s projected that in the next decade, the Gulf of Guinea — with an estimated 14 billion barrels in oil reserves — will double production from 4 million barrels per day to 8 million barrels per day. While West African states, particularly Nigeria, Ghana, Benin and Senegal, are taking practical steps to police their waters, Musah said hardly any of those states can boast enough maritime capability beyond 100 nautical miles off the coast. Sections of the American society have developed peculiar cultures. When a family loses a relative, they can hire mourners to do all the mourning and grieving for them. They will dress them in black robes to pause as genuine grieved family members. Their job is to appear at the funeral service, look desperately grieved and even lay a wreath on the coffin and walk away having been paid handsomely for that special appearance. Here in Kenya, especially among the people of Nyanza, there are a group of “professional’ mourners that invite themselves at every funeral irrespective of whether they know the dead or not. Their motivation is the feast that normally accompanies most burials in Nyanza; more so if the dead came from a well- off family. Such mourners are conspicuously absent from poor family funerals because in such homesteads, food is hard to come by. The behavior of some of our politicians over the last year has given us good examples of outsiders that normally grieve more than the bereaved. To the ordinary observers, such behavior is strange, uncalled for and raises eyebrows. However to the individuals prone to going in a trance, their behavior is normal because they know what motivates them. The American professional mourner is very clear about his or her mission. The mourner is in it for the cash pure and simple. The Kenyan counterpart is there for the stomach period. What about the Kenyan politician who has been following Ruto and Uhuru all the way to The Hague and back and now in all prayer rallies all over the country? What is it that has been motivating some of them to go on overdrive with their shuttle diplomacy to “save their friends” from the ICC trials? Were they doing this for the Ocampo Six or were they motivated by personal interests? When the Ocampo Six appeared at The Hague for the Pre-trial Hearings, close to thirty MPs accompanied Uhuru and Ruto to The Hague. They adorned the Ruto “patriotic hat” and even sang Kanu Yajenga Inchi, the Kenya National Anthem and yote yawezekana bila Ocampo. Conspicuous among these cheer leaders was one Jeremiah Kioni the Ndaragua MP. Give or take, they looked genuinely in grief at the Ocampo Six pre-trials. They consoled the accused, paused for photos with them at the earliest opportunity, jostled for front row close-up shots with their heroes and vilified whoever was the cause of The Hague trials. You could see their behavior at the Jomo Kenyatta Airport the day Uhuru was departing to The Hague a second time! This obsession and ecstasy with the ICC trials has continued to take the country by storm since the ICC confirmed the trials for David Sang, Francis Muthaura, Uhuru Kenyatta and William Ruto. However, for some reason, these prayer crowds seem to have forgotten David Sang and Francis Muthaura. The focus of the mourners has been on Uhuru Kenyatta and William Ruto. The more the prayers have spread to different parts of Kenya, the longer the line of mourners has grown. Conspicuous VIP mourners have been prominent in Eastern.Western, Coast, North Eastern, Central and Rift Valley regions. In Mt. Kenya, we have had Esther Murugi who at one time threatened to strip naked if Uhuru’s trial was confirmed. She has yet to make good her threat. Also in the mix has been Jeremiah Kioni from Ndaragua until something went wrong at the Machakos prayer meeting. He has since been relieved of his duties at the G7 meetings. However, if one looks at the common thread among all these mourners across the country, one sees that they are relatively poor compared to Uhuru and Ruto. They are also prone to sycophancy. They are the type of people who would follow you for what you have and more importantly for what you can give. Except for Johnston Muthama who has been in the group for the sake of being closer to power, the rest of them are economically challenged hence their determination to hang on to the coattails of those that can give them the necessary political clout while at the same time footing their bills. Kalonzo Musyoka may have not been in the group for crumbs from the high table per se. His is a higher goal than the rest of the “mourners” of the Ocampo Two. He is in it as a possible beneficiary of the Kikuyu and Kalenjin vote should Uhuru and Ruto go for full trial. Unfortunately for Kalonzo, he stands to lose the most because as Mutula Kilonzo keeps saying; his continued presence at these " prayer meetings" is denting his image as a future president of the Republic. His detractors now see him as an opportunist of the worst kind. Unfortunately for him, Uhuru and Ruto also see him that way! On a purely social occasion, Yoweri Museveni was in Kisumu 11 years ago to celebrate 100 years of the Uganda Railway reaching Port Florence now Kisumu. At that time, he was not the only Head of State to be in Kisumu for the occasion. Benjamin Mkapa of Tanzania and Daniel arap Moi were there too. Then, as this last weekend, the residents of Nyanza, Rift Valley and Western Kenya thronged the city. It was a sea of humanity with crowds waving friendly placards just as they did this time round. After the celebrations at the Moi Stadium in Kisumu, the three presidents headed towards Kisumu Yatch Club were they had a hearty meal with local residents as fishermen from Uganda, Tanzania and Kenya entertained them with a canoe race and local traditional gigs. 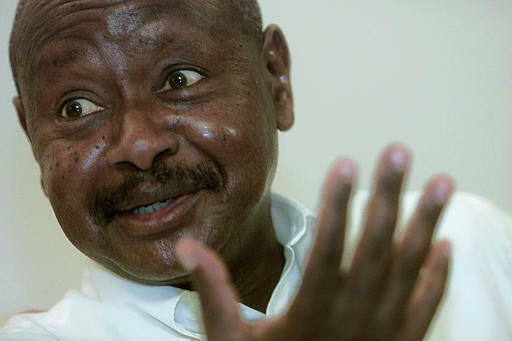 The night before, both Mkapa and Museveni had chosen to travel to the Lakeside City by road greeting people along the hundreds of miles as they snaked to the city. At the end of the celebrations they went back to their respective countries leaving Nyanza residents with an event to remember for many years. On that occasion, the most memorable gift the three heads of state gave Kisumu was the elevation of the town to city status; a decision that was appropriately pronounced by Benjamin Mkapa and endorsed by his two peers. Then, as last weekend, Raila Odinga, then a minister in Moi’s government was their host. Other than celebrating the 100 years and declaring Kisumu a city, they pledged a speedy political integration of the EAC Member States. The virtues for such a venture were the same as the ones articulated by Yoweri Museveni and Raila Odinga this last weekend. A few years later, East Africans may remember that Yoweri Museveni took another risky road show by bus to visit Kenya and Tanzania on two different occasions. At that time, the official version for choosing a bus ride was to experience firsthand what motorists went through plying the bad roads in East Africa. However, uppermost in his mind was to gauge ordinary public opinion about the possibility of an East African political federation where ordinary people would be free to travel, trade and settle anywhere in the region without the annoying demands of work permits, passports and rights to be in any territory 24/7. Museveni toured Kisumu to raise funds for the new Great Lakes University. This was significant in more ways than one. First, Museveni was reaffirming his unequivocal support for the International Conference on the Great Lakes Region situated in Burundi which has in turn set up the Levy Mwanawasa Center for Excellence to promote Democracy, Good Governance and Human Rights values in this region. When I was in Lusaka recently at the invitation of the Levy Mwanawasa Center, the Center Director, Dr. Frank Oyugi- Okuthe confirmed to me that the role of the center is to harness the best brains in the region to act as a think tank for member states. Such brains would definitely be derived from institutions such as the Great Lakes University of Kisumu. The think tank’s scope has already been set out- to make this region conflict –free, entrench good governance and democratic culture and to cultivate respect for human rights. Museveni’s presence in Kisumu to inaugurate the Trust Fund for the Great Lakes University was no coincidence. It was a carefully considered move on his part bearing in mind that he is the current Chair of the ICGLR following the demise of Zambian President, Levy Mwanawasa back in 2009. Even though he made a joke about new university courses such as Conflict Resolutions and Management; the truth of the matter is, Museveni is acutely aware that conflicts in this region will be with us for many generations to come considering what goes on in Somalia, Darfur, Southern Sudan, Kenya, Ethiopia, Zimbabwe and DRC. However, his advocacy for food sufficiency in the region as one way of minimizing conflicts must be lauded by even the most unrepentant critics of the Ugandan rule. A full stomach tends to sleep better than a stomach ravaged by the fangs of hunger. However, what was unique in Museveni’s Kisumu visit was his engagement with locals after the official function. He drove for 2 hours to Raila Odinga’s rural Bondo home, greeting locals along the way to Kango’ Ka Jaramogi where he paid his respects to the late Jaramogi Oginga Odinga. He then went to Raila’s home for an evening meal and mingled with villagers for close to six hours when he drove back to Kisumu city for an overnight stay. Leaving Bondo after 10pm was a sign of confidence that the people of Nyanza meant well and no harm would come his way; after all, he was the guest of the Prime Minister. But it also proved that he trusted his host to provide for his security 24/7. It is this trust for one another that can build confidence among our political leaders. Once this confidence is built at that high level; chances of it trickling down to the common Kenyan, Ugandan, Tanzanian, Burundian and Rwandan are very high. It reminds me of another social visit between Museveni and Kagame. I remember during the last Christmas, Kagame actually visited M7 at his rural home where they tended to his herd of cows together. Yes, M7 is on the right track and we in East Africa could do more with these bonding social visits by our leaders. HOW WILL KENYANS REMEMBER JOHN STANLEY MICHUKI? John Michuki, the MP for Kangema for close to 20 years died early this week after a short illness at the Aga Khan Heart and Cancer Center in Nairobi. Until his death, he was the minister for Environment and Mineral Resources, having served as minister for Transport, Finance and Internal Security under the Kibaki government since 2003. At the age of 80 when he passed on, John Stanley Njoroge Michuki had seen it all. He served the colonial government as a ruthless and focused District Officer during the Mau Mau war where his main assignment was to hunt down Mau Mau sympathizers and deal with them according to the colonial law. On the eve of independence, he was one of the few Kenyans the colonial government gave a scholarship to join Worcester College in UK to study economics, finance and administration. He returned to Kenya when Kenya attained independence and joined Jomo Kenyatta’s administration but soon found his way into the Treasury first as Executive Chairman of the Kenya Commercial Bank before moving to head the Treasury and Permanent Secretary under Mwai Kibaki. Michuki’s records at KCB and Treasury were clear and without blemish. The kind of corrupt deals that later dogged KCB and the Treasury in the Moi years were unheard of under Michuki’s watch. No wonder in those years, the economy was so strong that the Kenya shilling could be exchanged in London. 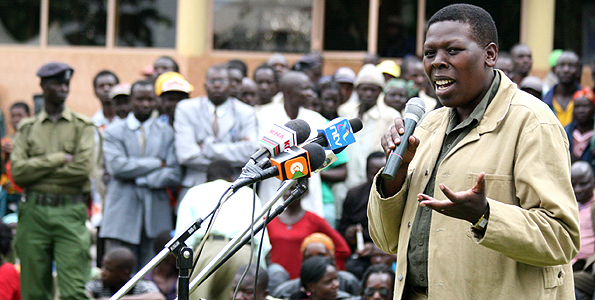 As a politician, Michuki changed the face of Muranga politics. The dominance of KANU sycophants singing Nyayo tunes day in day out began to subside. No wonder he lost his seat during the 1988 mlolongo elections. That was the election that also caused Kenneth Matiba to part ways with Moi. John Stanley Njoroge could be accused of any political sin under the sun. But there was one thing the son of Kangema never did. He never dipped his fingers in to public coffers even when he had an opportunity to do so. It is the reason all the scandals that have rocked Kenya since 1992 to date involving high flying politicians have never touched John Michuki. When fellow cabinet minister Amos Kimunya was forced to step aside following the 2008 parliamentary censorship over the sale of Grand Regency Hotel to Libyans, it was to Michuki that Kibaki turned to as an acting Finance Minister. Yet, when Kenyans suggested that he takes over the Treasury and let Kibaki appoint someone else in the Environment Ministry, Michuki declined the most coveted job in Kenya. He wasn’t interested. He had in amazement seen his colleagues’ careers ruined by that ministry in recent years. Kenyans will most remember John Michuki in the way he dealt with public transport when he assumed that docket in 2003. Just under one year, Michuki brought sanity to the public transport sector- more so the dysfunctional and mannerless matatu industry. Suddenly, touts and drivers started wearing uniforms and name tags. Suddenly all matatus had a yellow line. Suddenly all matatus were assigned specific routes. But more importantly all public and private vehicles were forced to have passenger seat belts. However, he went a notch higher with matatus and buses. All of them were installed with speed governors. As Minister for Internal Security, Kenyans will remember the good and the bad things John did. He decisively dealt with the Mungiki sect that had become the law unto itself. The group that had formed a parallel government, levying taxes on matatu operators and charging residential security and utility services met their match when Michuki assumed the Internal Security docket. Fear and havoc which was their stock in trade in Muranga and other parts of Mt. Kenya region had to stop. Because these gangs killed and terrorized without mercy, Michuki chose to meet fire with fire. He ordered the police to hunt and shoot to death any gang member they found. Within two years, the Mungiki militias were on the run with hundreds locked up in Kenyan jails. The few that survived including their leaders turned to Jesus Christ for survival. However, John Michuki’s life was not without controversies. The first time Kenyans read Michuki’s mind was when LDP and DP were arguing over the failed MoU that Kibaki had signed with Raila Odinga. When asked why all of a sudden the DP members were not interested in the post of Prime Minister they had campaigned for so hard under Moi, his reply was that politics was like a liver. “When you hold liver in your hand, you must keep juggling it lest it drops”. When pressed to comment on the Standard Newspaper raid in 2006, all he could tell the same media was that, “if you rattle a snake, you must be prepared to be bitten”. It was also under Michuki’s watch that known international criminals-the Artur brothers entered Kenya, terrorized us and went away without facing the law- a real contradiction in Michuki’s life. His parting shot was to install Uhuru Kenyatta as the undisputed Kikuyu leader; warning other Kenyan politicians that only through Uhuru could they deal with Kikuyu community. Rest in peace John Stanley Njoroge!